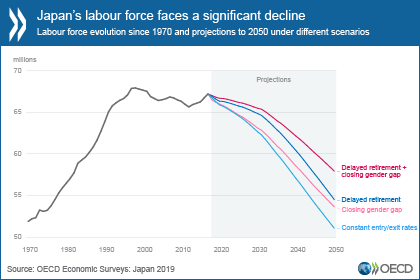 With Japan’s population projected to remain the oldest in the OECD, the Survey underlines the need for wide-ranging labour market reforms for a shrinking workforce. A shift to more flexible employment and wage systems based on performance rather than seniority would enable Japan to better utilise its human capital, including women and older persons, the Survey said. This should include abolition of firms’ right to set the mandatory retirement at age 60, reducing the link between seniority and wages, and renewed focus on measures to remove obstacles to employment, to increase women’s access to childcare, and to allow them to play a greater role in the workforce. With the rising number of elderly putting increasing pressure on public spending, further efforts will be needed to stabilise Japan’s public debt, which at 226% is already the highest in the OECD. \A comprehensive fiscal consolidation plan – covering specific spending cuts and tax increases, including a further gradual rise in the consumption tax – will improve fiscal sustainability. *SOURCE: OECD. Go to ORIGINAL.